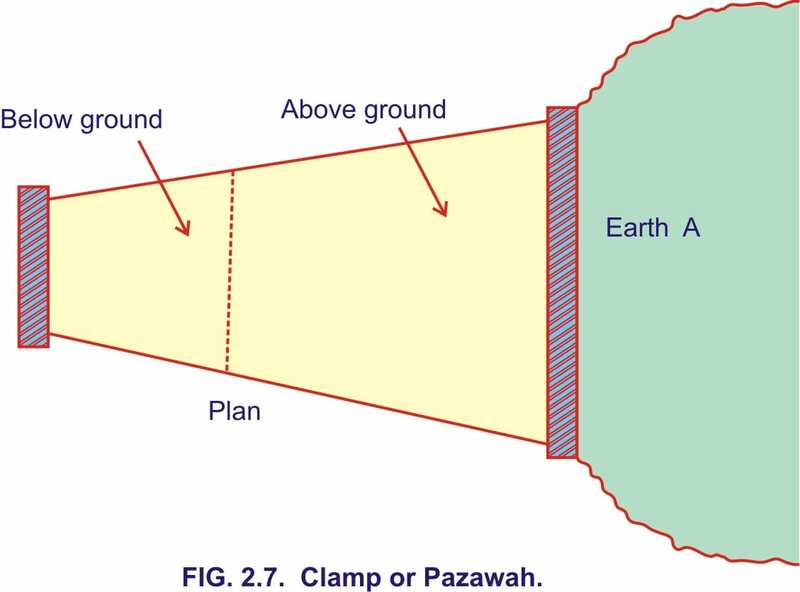 Working of Clamp or Pazawah,Bull’s trench kiln,Hoffman’s kiln. 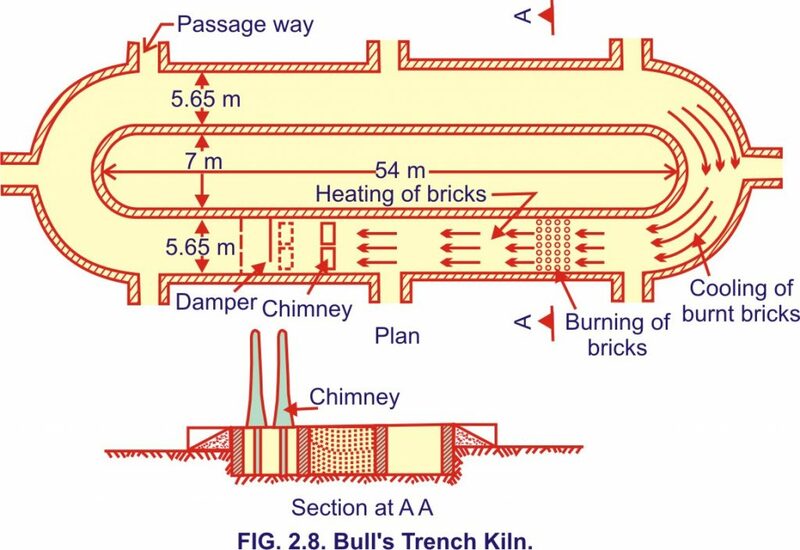 In this Article Learn about: Burning of bricks,Clamp or Pazawah,Bulls trench kiln,Sequence operation of Bull’s trench kiln, Advantages and disadvantages of Bulls trench kiln,Hoffman’s Kiln,Advantages and disadvantages of Hoffman’s kiln. After the bricks have dried in sun these are burnt in kilns to make them harder, stronger, denser, less absorbent and consequently more durable. The bricks are burnt either in a (i) Clamp or Pazawah; or (ii) Kiln-(a) Intermittent, (b) Continuous. Working of each one of them is described below. The shorter end is slightly in excavation while the wider end is raised a little above the ground. The sides in excavation and opposite to it are parallel, the one in excavation being about half as long as the wider one. A layer of fuel consisting of grass, cowdung and litter, about 75 cm thick is laid on the floor. On it four or five courses of bricks are arranged on edge with small spaces all around each one of them. A second layer of fuel followed by another four to five courses of bricks on edge are laid and so on. 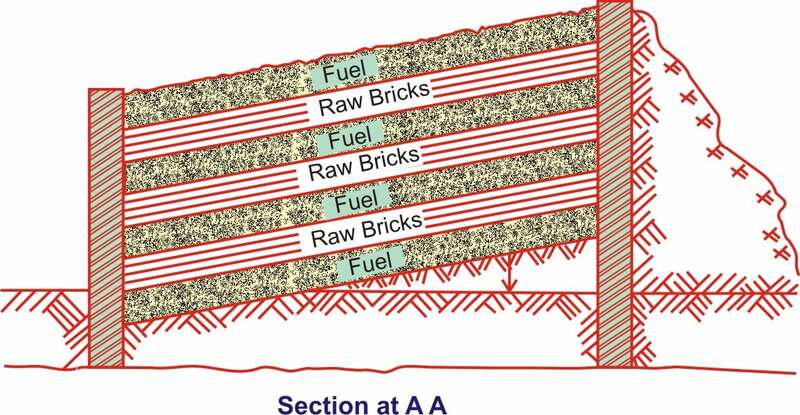 The thickness of fuel layer goes on decreasing towards the top. The clamp is fired at the lower end at bottom when about one-third of it has been loaded. Further loading continues. It is done so that the lower portion is fired when spaces for upward draught are still open. When the loading is completed the whole of clamp is plastered over with mud so as to check the loss of heat. It is then left to burn itself and then to cool. Wood or coal dust could also be used as fuel in clamps. When the clamp has cooled down, it is unloaded and then it is reloaded as before and refired. It thus clearly gives intermittent supply of bricks. Initial cost as well as the cost of fuel is very low. This method of burning bricks is well suited for remote country sides where a limited supply of not more than 1,00,000 bricks is needed at a time. As no supervision is needed after the clamp has been fired there is consequent economy in its operation too. A large percentage of bricks turned out of clamps is of a poor quality. Each clamp burns 25,000 to 1,00,000 bricks, and takes about three months to burn and cool. It is the most widely used kiln in India and gives continuous supply of bricks. It is made in a trench excavat­ed below ground surface (Fig. 2.8). The trench could be fully in the ground or partly in excavation and partly made with earthen embankments. The trench generally oval or circular in plan and about 2 metres deep. In various zones of the kiln trench all the different operations viz. loading, unloading, cooling, burning and heating of bricks goes on simultaneously. Zone 1- Burnt bricks being cooled. Zone 2- Bricks being burnt. Zone 3- Loaded sundried bricks are being heated by hot air from zone 2. Zone 4- Fresh sundried bricks being loaded. Zone 5- Cooled bricks being unloaded. The whole working is so arranged that operations in all the zones are completed simultaneously. At this stage, the operational cycle shifts by one stage. Instead of in Zone I cooling of burnt bricks starts in Zone 2, burning of bricks in Zone 3 instead of in Zone 2; heating of loaded sundried bricks in Zone 4 instead of in Zone 3; loading of fresh sundried bricks in Zone 5 instead of in Zone 4 and unloading of cooled bricks in Zone 1 instead of in Zone 5. This cycle of operations continues whereby we get regular supply of bricks. While loading, sundried bricks are so stacked in the kiln as to leave spaces around each brick. Vertical flue holes, to feed fuel to the fire burning at the bottom, are provided at about one metre intervals. The kiln is loaded in section about 3.5 metre long with a clear space of 15 cm between the section over which two draught chimneys are provided. After a section of the kiln has been loaded, it is covered over with earth and ash to prevent the loss of heat. Even the flue holes are closed after the fuel has been fed to the fire. Draught of fresh air is admitted to the zone where the bricks are being cooled. In cooling the bricks the air gets heated. It is this hot air that helps burning of bricks. Hot air from burning zone passes through the next zone where the bricks to be burnt are heated. In heating the freshly loaded bricks the hot air gets cold when it escapes through the chimneys. When the heated bricks are fired then chimneys are shifted to the next zone. The chimneys go on being shifted as the burning opera­tion progresses. Each section takes one day to burn. Advantages of Bull’s Trench kiln. (i) It gives a continuous supply of bricks. (ii) It gives a high percentage of first class bricks. (iii) It saves cost of fuel as the hot gases from the burning zone heat the bricks to be burnt next, before escaping through the chimneys. (iv) Drying space is saved as even raw bricks can be loaded in it which are dried before being burnt by hot air coming From burning Zone. Disadvantages of Bull’s Trench kiln. (i) It needs constant skilled supervision. (ii) Its initial cost is high. It is a continuous kiln and has a permanent roof as a result of which it can function even during rains. It is circular in plan and is built above ground. 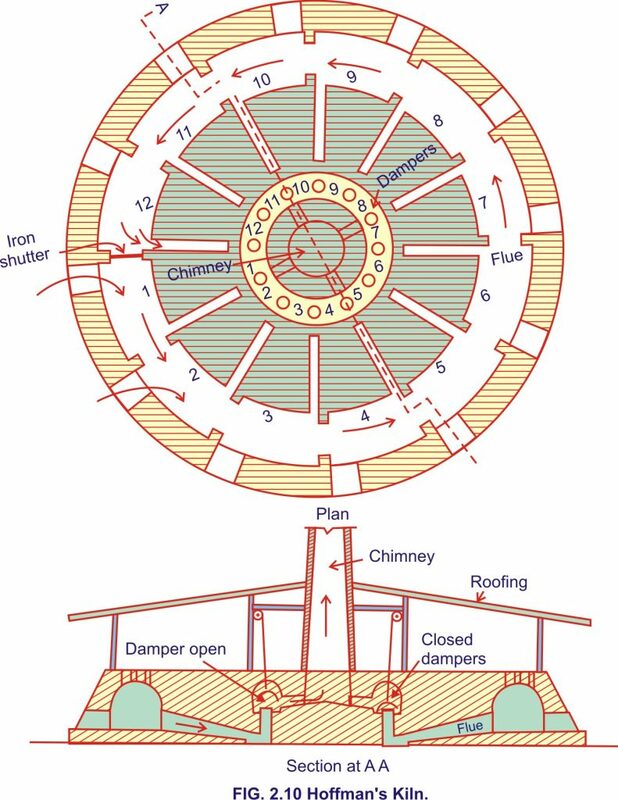 It has a fixed chimney at the centre around which the kiln is divided into 12 chambers in a ring. Each chamber has a door communicating with the outside and a flue leading to the chimney. The door could be closed with dry brick wall having sand packing. The flue could be closed or opened as desired by operating a metal plate known as damper. Air enters the kiln through doors 1 and 2 as shown in Fig. 2.10. While passing through the burnt bricks in chambers 1 to 4, it cools them and gets heated in turn. This hot air then passes through chambers 7 to 10 heating the bricks to be burnt. The iron shutter at the end of chamber 10 is closed and the flue number 10 is open through which the hot air, which has now cooled down while heating the bricks in chamber 7 to 10, escapes through the chimney. Bricks in chamber number 11 are being loaded whereas those in chamber number 12 are being unloaded. When chamber number I l has been loaded then the iron shutter is shifted to the end of chamber number 11 and also flue number 11 is opened after closing flue number 10. The whole cycle of operations, has thus moved one step forward and this process continues. Fuel is fed through fuel holes provided for the purpose. In this kiln great economy in the use of fuel is effected and at the same time percentage of first class bricks obtained is higher than those from any other kiln. Also as in Bull’s trench kiln raw bricks can be loaded in this kiln which saves the drying space. Its initial cost of construction is high. A chamber 11 metre long, 4.5 metre wide and 2.75 metre high is capable of yielding 25,000 bricks/day. (i) Working of the kiln is not interrupted by even rains. (ii) Fuel consumption is low as hot gases are utilized to dry and heat raw bricks. (iii) Percentage of first class bricks obtained from the kiln is fairly high. (iv) Space and time are saved in drying as raw bricks are directly loaded into the kiln. (i) Initial cost is very high. (ii) Highly skilled labour is required to operate it.